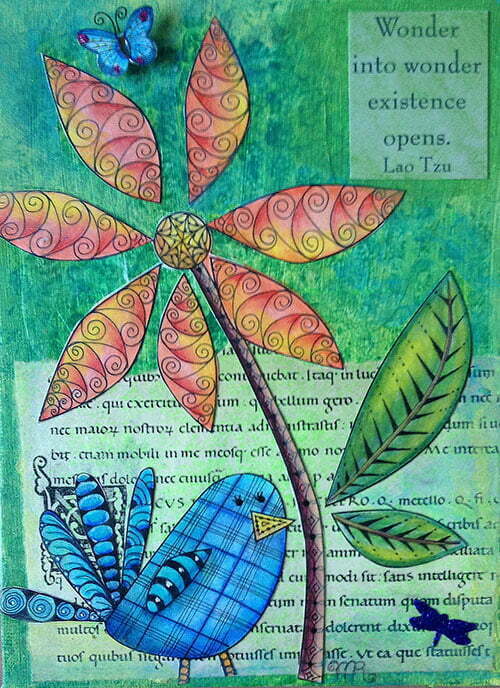 Fun with Stripes and Curves: Weekly Zentangle Challenges Motivate me! School started this week, and while I am doing my happy dance to have the kids out of the house during the day, I am also glad it’s Friday and we have a long weekend here in the states. Kids are tired and grumpy and while I don’t feel grumpy, I am a bit tired and looking forward to some play time in my craft room this weekend. Spending time tangling or making art are my favorite ways of relaxing yet creative expression is much more than that from my perspective. It’s also meditative, spiritual and thought-provoking. It can be healing when we are sad, depressed or just tired from a busy week. I love the quote by Lao Tzu in the artwork above: “Wonder into wonder existence opens.” Creative expression can help us reconnect with our own childlike sense of wonder. Looking at the world with wonder in our eyes allows us to see creative solutions to current challenges and lifts us out of depression, over-thinking or feeling stuck and overwhelmed. I find that while I am tangling, drawing, painting or making collages, my mind soars with bright ideas. That’s why I am such a big fan of teaching others to use creative expression as a tool for growing their business. I love participating in art challenges like this one, they take the thinking out of the process – no worrying about what to work on, I can just dial in and create! No matter what kind of work we do during the day, creative expression creates time and space for us to step outside of our regular schedule and our regular thought-patterns. There is something about keeping our hands busy with creative work that allows our mind to roam, to look at problems from new perspectives or to dream up new projects. Release your inner critic, I can feel you cringing already! All of these forms of creative expression are about enjoying the process and letting go of the outcome! 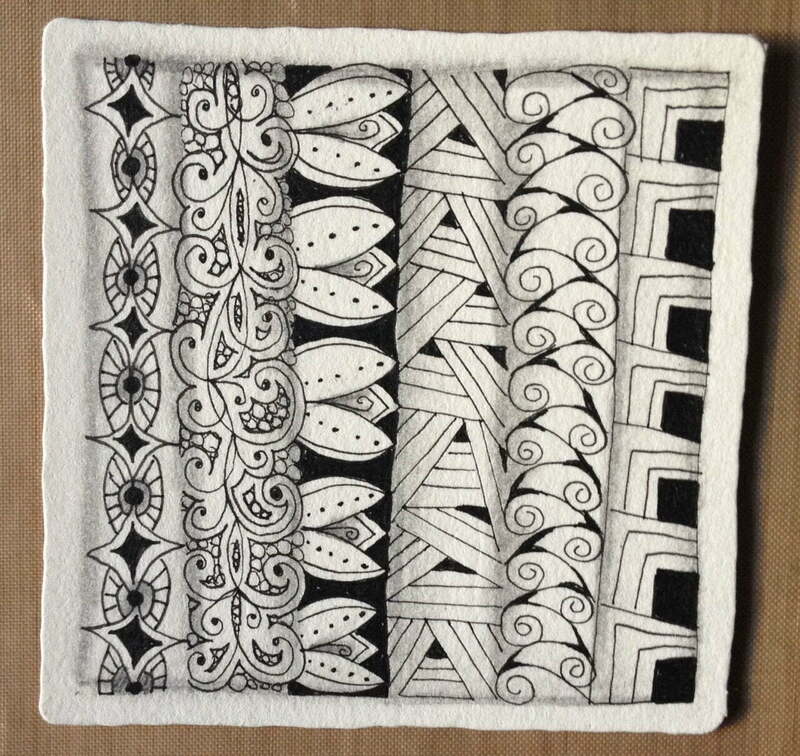 These Zentangle© tiles are unplanned and based on filling spaces with patterns. Even the collage at the top was unplanned, coming together in layers over a few days. 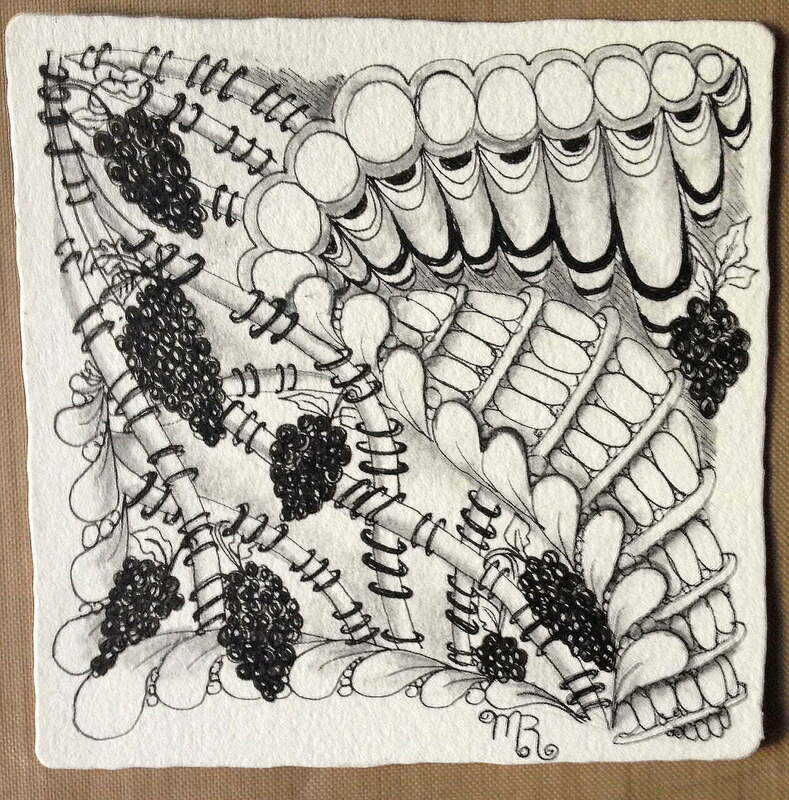 If you are interested in learning more about the Zentangle© process or other forms of creative expression, Dr. Minette Riordan does offer one-on-one sessions in person in Santa Barbara, CA or via Skype anywhere in the world. If you are ready for more creative play but don’t know where to start, let’s connect. Feel free to send me an email: minette@minetteriordan.com. Minette, I love your encouragement of your readers to make time for a mind-opening form of creativity that is inspiring to us. I, too, enjoy coloring mandalas–it’s a meditative practice for me, and a wonderful chance to interact with color. You’re reminding me to make more space for that. I had forgotten all about drawing mandalas! I did them years ago and they were a perfect expression for my then labeled non-artist self. You know you are preaching to the choir with me about the power of creative expression. It’s important to realize that you can do everything creatively. It’s not limited to the arts! Both are very beautiful and so is your post.